I had never seen this before. I was not sure what to expect, but was absolutely looking forward to it. The opening credits assured me that I was going to enjoy what was about to be shown on the screen. Shortly after the title of the film is shown, the name Mary Blair appeared, as well as four of Walt Disney’s Nine Old Men (Frank Thomas, Wolfgang Reitherman, Ward Kimball, Milt Kahl). From this moment on, the film did nothing but prove its worth. This 1942 classic reminds me quite a bit of Fantasia, not only in the various levels of animation ability, but in the stories which are pieced together to form a masterpiece. Similar to what may have been a sign of what was to come later, Saludos Amigos combines scenes of live action and animation. Not together such as in Who Framed Roger Rabbit, but separately, so you do not know what will be shown next. This mysterious factor adds to the enjoyment and surprise of the film. I’m assuming that the live action men shown in various scenes are none other than the animators involved in the making of this film. At one point, we see Walt Disney giving instruction over an animator’s shoulder on how he wants a figure to be drawn. We cannot hear what he is saying, but the movements of his arms and steady concentration show that he is in full animator mode, wanting everything to be perfect as he always did. It is also amazing how Disney wanted to incorporate the dedication of the crew who flew to these countries to accomplish their hard work; he did this by including their faces throughout parts of the film, which is uniquely fantastic. A delightful scene in the film depicts a child training his llama using his flute as direction. Utilizing upscale and downscale notes, the llama changes his stance according to the melody. This is both uniquely animated and well coordinated. There is also a laugh out loud scene involving a slow bridge collapse. Once again, the music is well timed to the stomping of panicked feet, as they try to make their way into survival. The scene ends with Donald Duck swimming away in what appears to be a ceramic pot. A truly wonderful scene involves Papa Plane, Mama Plane, and their incredibly adorable son, Pedro Plane. This is based on Papa coming down with a cold, so Pedro has to rescue the mail for him. It is such a sincere, kind moment. You are pulling for Pedro every step of the way. At one point, it seems as though Pedro may not make it out of the storm alive…but luckily, he does, much to the happiness of Papa and Mama. Every scene of this film is beautiful, but one which is particularly so is called Watercolor of Brazil, where you see the animated hand of the artist painting scenes of his home country. The accompanying music is brilliant. He not only paints bodies of water and palm trees, but he adds a bit of comic delight as well. For instance, he paints lips on the flowers so they may sing along with the music; also, bananas form into toucan beaks, as multiple toucans gracefully sit to enjoy their surroundings. Toward the end of the film, the artist draws José Carioca of The Three Caballeros fame. Donald Duck tries to swipe the painting away as it is being drawn, but he fails in this attempt. When the two lovable birds meet, Carioca’s imitation of Donald Duck literally made me laugh out loud. His manic expression, followed by speaking supremely fast in the Spanish language was sheer hilarity. Poor Donald is confused and is trying to understand what he is saying, as he grabs multiple translator books to try and figure it out. Fred Shields narrates the film, who has also given his voice to various Disney classics such as the Great Prince of the Forest in Bambi (1942) and the narrator of The Three Caballeros (1944). In addition, he has narrated the shorts How to Play Baseball (1942), Pluto and the Armadillo (1943), Victory Vehicles (1944), and How to Play Golf (1944). José Oliveira voices José Carioca. Oliveira is originally from Rio de Janeiro, Brazil, and has lent his voice to the heart-warming Carioca through shorts and films. Pinto Colvig voices Goofy in this film. Colvig is an unbelievably rare talent who has voiced Oswald the Lucky Rabbit (who is making a comeback, folks, so stay tuned to your Disney news), Pluto, and Goofy in a countless number of shorts. He was a multi-talented voice actor from 1925 until 1965, two years before his unfortunate passing in 1967. Clarence Nash voiced Donald Duck, not only in this film, but in many shorts as well. Similar to Colvig, he was an extremely talented individual. Nash voiced our heroic duck from 1934 to 1971. Two years before he passed away, he lent his voice to the short Mickey’s Christmas Carol (1983), where he voiced the role of Scrooge’s nephew Fred. Saludos Amigos is directed by Wilfred Jackson, Jack Kinney, Hamilton Luske, and Bill Roberts. Jackson has been involved in the directing of other timeless Disney classics such as Cinderella, Dumbo, Alice in Wonderland, Lady and the Tramp, and Peter Pan. Jack Kinney has directed many shorts including Casey at the Bat from 1946, as well as the film Make Mine Music. Luske was involved in the same films as Jackson, excluding Dumbo. Roberts has been a sequence director for Bambi, Dumbo, Fantasia, and Pinocchio among others. The music in this film is truly delightful. 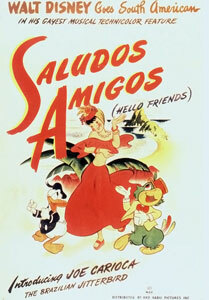 The first song in the film, played during the opening credits, is “Saludos Amigos” with music by Charles Wolcott and lyrics by Ned Washington. The beautiful song “Aquarela de Brasil” is written by Ary Barroso, and sung by Aloysio De Oliveira (assuming this is a relation to the José). “Tico Tico No Fubá” is written by Zequinha De Abreu, and sung by José Oliveira. My absolute favorite scene is Goofy playing the gaucho accompanied by his horse. This is very similar to the aforementioned shorts which I love, How to Play Baseball and How to Play Golf, which might explain why I love it so much. The bond which Goofy and his horse share in addition to the laughable moments at the campfire during their singing and dancing, are positively smile-inducing. As for a favorite character, it would be difficult to choose since this film is broken up into so many parts. I do love Donald Duck and José Carioca, so they would remain at the top of my list. Saludos Amigos is an absolutely timeless treasure. It is the type of film which I want to tell other people about, and encourage them to watch as well. There is nothing overly serious about it. It is rather a lighthearted film which will make the viewer smile. Everyone needs a few moments in their life to sit down and escape reality for a while. Spending one of those moments to watch this film would be a wise decision. Shut up, you big windbag!